Canning and preservation of food can happen year round, but it’s during the summer when people consider putting up the excess of the season the most. My Instagram feed is jammed with photos of …. well, jam. And pickles! Oh, the pickles. They are everywhere, veggies of every sort soaked in vinegar and spices and the giddy anticipation is felt right through the computer. It seems that the waiting time for proper pickles of any kind is now akin to the last few days before Christmas in it’s anticipation. Growing up, my Mom did not do any preservation. During the Summer she spent plenty of time and cash purchasing cases of peaches and cherries, and maybe a pie or two was made from the bounty, but she loved fresh fruit, and we loved fresh peaches and cherries and most of that case would end up in our mouths, fruit juice staining our shirts or running down our elbows; I have the quintessence Summer memory of sitting on the back steps with a peach in hand, pressing my teeth over and over in to it’s superb flesh, and getting soaked in sticky-sweet juice like every child should at some point or another. The smell of ripe peaches catapults me backwards to sultry Summer, and the eager anticipation of that overflowing box of fruit, colanders filled in the sink while a Summer breeze shifts the window curtains, and more sweet, intense peaches, or cherries, to eat than should be legal. I love the idea of canning fruit, but there isn’t even comparison to flavor of fresh, no matter how diligent you are in the process, and that slip of difference always keeps me in check when I think of fresh peaches any other time of year. If the burning sun isn’t drying peach juice on your hands, it just isn’t the same. My sister-in-law is the jam-maker in the family. She loves it, and makes quite a lot that she happily shares. I love a good, homemade jam, and I’ve tried making it a few times. Once, it was perfectly jam-like and I didn’t mind the process at all. We coveted the result, too; opening a fresh jar of deep and dark jam that smelled like summertime was such a treat in the dead of Winter. The next time I ventured to make it, it felt like the process was mocking me. It didn’t feel right, nor did it go right, and the final result was more like a thick syrup than anything close to resembling jam. We ate it anyway. Are you kidding? Blueberry syrup is divine. From that moment on, I just made syrup. Forget the jam. Me and pectin apparently don’t know how to figure each other out. 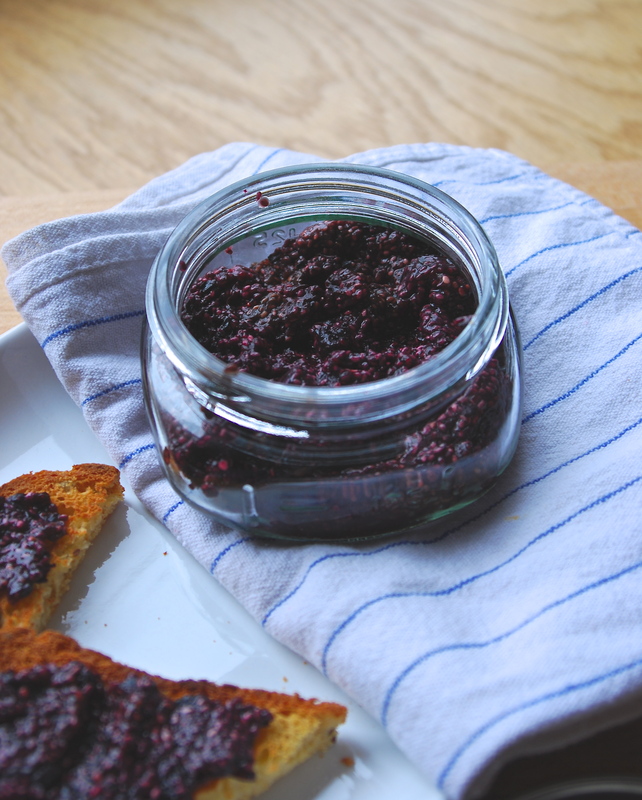 This raw Chia jam isn’t even like jam at all, except a bit in it’s consistency. 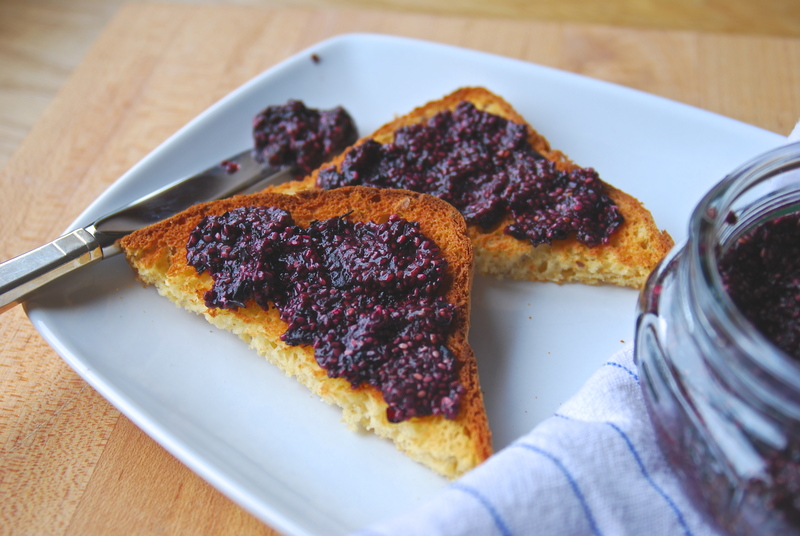 If you’ve ever made a pudding with Chia seeds, then you can kind of get how this jam works- the mighty little Chia seed, worthy of soaking in up to 10 times it’s weight in liquid, is the binder, no pectin needed. Fresh fruit is whirred in the food processor with Chia seeds, the scrapings of a vanilla bean and a good dose of crossed fingers, then in a jar it goes for an overnight stay in the refrigerator. The next day, spread on toast, it’s fruity, with the tiny, almost imperceptible gel-like quality of Chia and the unearthly beautiful scent and flavor of fresh vanilla. I buried the vanilla bean pod in the jam for it’s overnight, to infuse more of the flavor because a vanilla bean buried in anything with fruit is magical in every way. What the jam isn’t is overly sweet. There is no added sugar, which you need a ton of in homemade jam. In this version, you taste fruit, subtle and sweet all on it’s own, but if you like the cloying sweet taste of jam with it’s sharp undercurrent of pectin to hold it’s shape, this jam might not be for you. But I encourage you to try one jar, as it’s just the simplest of simple things to make, and keep your mind open to possibility. It may ‘Wow’ you in an unexpected way. My original inspiration came from Shockingly Delicious, who’s photos of her Raw Strawberry Chia Jam made my eyes bug out. I switched out the vanilla syrup that her recipe calls for to use the vanilla bean, and instead of lemon juice, I added fresh squeezed lime juice and a bit of zest, which you just don’t taste at all as much as it adds a dash of brightness to the final end result. And it should suffice to say that any fresh fruit would make for a fine substitute for the Blueberries. Get crazy with it. Place all ingredients in a food processor or blender and blend until smooth and consistent. Alternately, you can place all the ingredients in a bowl and mash with either a fork or a potato masher for a thicker, chunkier consistency. Scrape in to a jar with a tight fitting lid. Press vanilla bean pod down in to jam, seal lid and place in refrigerator overnight. Stir jam before using. Vanilla bean pod can be discarded or left in jam to heighten the flavor. I just blended this up using blackberries (and a dash of vanilla – no bean). Finally. A homemade jam I feel like I could make. I’ll be doing this soon. Thanks friend!